It's one thing when it's Congress or the political press calling you on your game. When photo editors start entering the investigative fray, however, you've got to wonder if what the homeland needs is protection from (rather than by) its King. Clearly, the guys who do the captions don't know how to properly parse words. > that court orders were needed to tap telephones. Clearly, the surveillance currently at issue is not technically tapping telephones. The surveillance currently at issue was not something you would hear about back at the time this statement was made, because it was secret. The surveillance currently at issue was not being done by law enforcement. In summary, Word Parsing-101, a necessary skill for understanding everything this administration says. Bush claims he did the illegal wiretaps to "protect" the American people. And here in New York, where there is a bitter transit strike, the Republican mayor Bloomberg (who didn't bargain in good faith with the Transit Workers Union) was angry that the strike happened during his "watch." This is the new Republican meme--we, your leaders, are here to "protect and watch over" you. And as part of their work "protecting" the American public, they feel free to ignore the law and trash civil liberties. 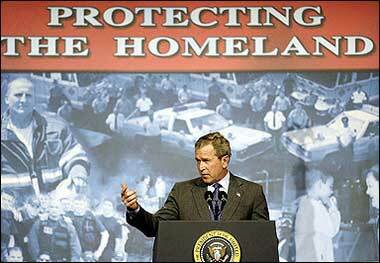 The top photo shows Bush beneath a slogan that says "Protecting the Homeland." That phrasing will morph into something more personal now: "Protecting You and Your Family." More paternalistic demagoguery. interesting that in both of these pictures GW is gesturing to the left of the frame. The gesture in the top photo gives me the impression he's calling somebody to him. The gesture in the bottom photo looks like an ordinary oratory gesture anybody would use in front of a crowd. In both the photos, GW has his back to people; photos of people versus actual people. I assume these are peole who support him as these are surely staged campaign events. In the light of recent news, and taken totally out of context, it looks like GW is "inviting" attacks from the left while rallying "supporters" behind him. He is trying to "smoothe over" or "greet" those on the left by using reassuring words and gestures, at the same time showing the left all the support he's getting. One year ago nobody would have thought he would have lied so brazenly about such things. 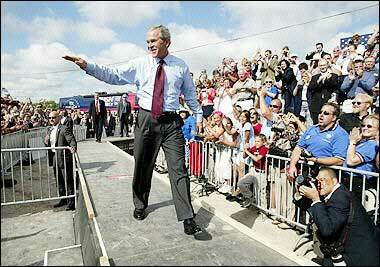 I wonder how many people Bush would have behind him now the ugly truth is out? I'm sure his handlers will continue to put people behind him to make him appear trustworthy, but I wonder if this period of the Bush presidency will be characterised visually by being up against walls and backdrops to shield his back from the daggers. There is nothing interesting about these images other than the fact that nobody other than true believers were allowed at these events so the only way a person with a brain can see them is via photo or video. Not only that but this is no doubt one of many lies Bush told on this day, or any day living in the bubble as feeding shitballs to his base. Even in the second photo what looks like a poser photo dude trying to get Bush in his frame with some clouds or a flag in the background. I love the Bag's observation that photo-editors have entered the fray. I noticed the same thing Victor F observed about both pictures have Bush's face and shoulders at the same angle, gesturing stage right. It made me google other images of Bush. Compare this groomed campaign portrait to this hotshot young man in his TANG uniform. In particular, I am thinking about how humans tend to perceive a right rotated face as happier and a left rotated face as sadder. The two pictures of Bush the the Bag posts both have the right-rotated, happier profile of Bush. Is there a tendency for Bush's phoos to be more right-rotated? The two I link are both frontal shots. Cover one side of his face at a time. In the campaign shot, Bush's left side has been smoothed out, made very symmetrical. Look at how the hotshot pilot has a more revealing expression. The right side of his face is quite bland and symmetrical. The left side has a contemptuous down-turned mouth and a wicked eye. Another intriguing visual effect is to clone the right and left sides of someone's face, flip each side horizontally, and rejoin them into new portraits. I've done this with Bush's campaign portrait, while keeping each split inside the outline of his head (and with the same distance between the eyes.) Here's a black and white composite image of the results. 'Split' portraits can make someone look like very different individuals, but I think Bush's images are pretty similar. It's also interesting to compare Bush's TANG portrait to a younger shot of his father. I lingered over the manipulated photos. It is startling to me how symmetrical Bush's face is--it is as if the campaign photographer washed away any asymmetry. People, of course, are attracted to highly regular, symmetrical faces. I guess Bush is just a regular guy, heh! Princess Diana is the other face that sruck me as unnaturally symmetrical. The results from our experiment regarding 'symmetry' show that facial symmetry affects the perceived attractiveness. However, the effect is rather small and by far not as influential as it has been reported in the media. To sum up our findings: Very asymmetric faces are judged rather unattractive, but very unattractive faces are not necessarily asymmetric. And vice versa : very symmetrical faces need not necessarily be judged attractive and very attractive faces often show deviations from perfect symmetry (see report!). Based on our results, symmetry only seems to be a rather weak indicator for attractiveness. Often it is even difficult to distinguish between the original and the perfectly symmetrical version, because irregularities in shape are rather insignificant. Therefore, the strong influence of symmetry that has been reported in the scientific literature over and over again is questionable. The higher attraction to slighty imperfect faces probably relates directly to your suggestion about slightly rotated portraits. If a face is too perfect, we enter the Uncanny Valley.